Researchers at Adobe Systems have posted a spectacular video demonstrating the manner in which artificial intelligence can be used enhance everyday selfies. Powered by Adobe Sensei, a sophisticated technology that combines artificial intelligence and machine learning, the retouching enhancements provided by the new software make it a fully-fledged magic wand. In Adobe Creative Cloud, the developer’s comprehensive collection of online tools, Adobe Sensei is already working miracles with its capacity to create elements that do not figure on the original photo by analyzing neighboring pixels. The recently posted video offers a spectacular demonstration of how users of the software can rework the form and position of a face by simply moving a finger on their smartphone touchscreens. Other features include the option to modify background depth of field for a blurred effect, or change the angle of view to create a more flattering portrait. Last but not least, users also have the option of cutting and pasting photo styles from one image to another. 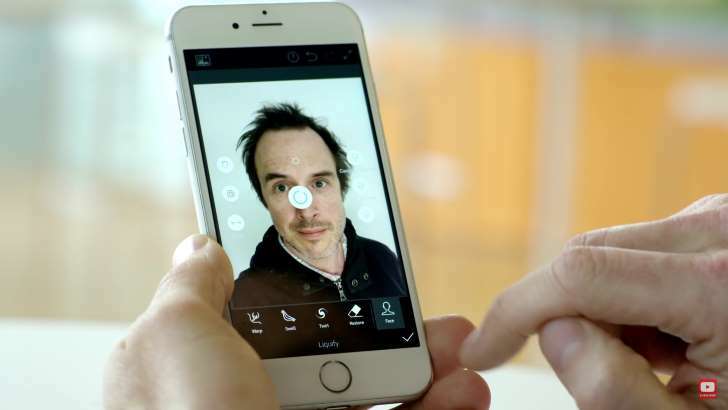 In the future, these functionalities may be included in certain products of the Adobe Creative Cloud range to enable users to intelligently retouch selfies before sharing them on social networks.